This loose leaf lettuce is easy to grow and save seeds from. Luckily I also planted some other veges that we didn't normally buy, and many of those were very successful, and have proven to be useful in meals as alternatives to our old favourites. This has made me more adventurous and interested in trying different veges. I think its important to find out what grows well in your area, particularly if you are trying to grow organically, plants that can't cope without chemicals will just be hard work. Then you need to work out how to eat them, and if you like them, you're onto a winner. This is all part of the fun! I believe that you should both eat what you grow and grow what you eat. 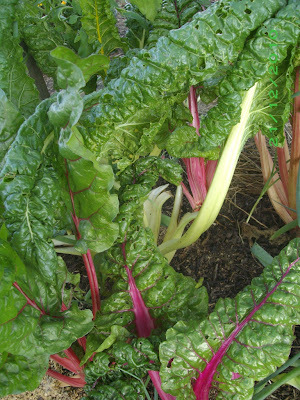 I love silver beet from my garden, but I never used to eat it. When you think about which veges you buy regularly, many are either cheap (carrots and potato compared to eggplant or herbs), or long lasting (broccoli and corn compared to things like silver beet, spring onions and lettuce, which quickly go limp in the fridge). Before we had the garden, I never bought silver beet, because I knew it wouldn't last long in the fridge, and I never bought eggplant unless if happened to be less that $6/kg, which is pretty much never. Honestly I NEVER ate silver beet until I grew it myself (even when my mum grew it, sorry mum!). There's something about putting in that effort to produce food that makes me find a way to eat it. This mini capsicum resists fruit fly better than the full sized ones. Yes, we had a pretty limited range of veges that we used to buy! Sad isn't it! Growing our own also means compromising on things that I used to buy, but find difficult to grow. For example, I find it very difficult to grow large tomatoes, as they are attacked by pests (big and small, from bandicoots to fruit flies! ), so I grow cherry tomatoes instead. 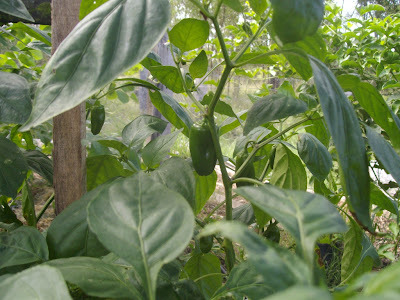 I had the same trouble with capsicums until I grew the mini ones that seem to survive better. I haven't had any success with under-ground onions, but spring onions are fine. Button squash do better than zucchinis and taste pretty much the same. Of the veges that we used to buy, I think the only ones that I've been able to grow are zucchini and green beans, with the occasional broccoli! We still buy corn, carrots, sometimes a cabbage, but the garden has certainly reduced the amount we spend on veges, without replacing them directly, just changing and adding variety to what we enjoy eating. The Poor Man's Bean took over my garden fence last year and produced more beans that we could eat! I still have that list of favourite veges in the back of my mind though, I really want to master carrots, corn, celery and potatoes, but I also need to focus on the veges that do well without much attention, because they are the ones we could live off if we had to and they produce a nice continuous supply of veges, even if the rest of my experiments don't work out. I especially like to find varieties that grow well and produce seeds that I can save for the future, as this creates a truly sustainable garden. I love that tomatoes now sprout from the compost, its like instead tomato seedlings without any effort! How have your eating habits changed since you started gardening? Do you grow what you eat or eat what you grow? I'm like you and carrots do not grow well here, but since they are so cheap compared to other vegies I am happy to buy them. I have purchased some seeds for new things like Daikon so now I just have to give them a go, then if they grow I lean how to cook them. Great post. I have become a bit obsessed with silverbeet and tend to use it whenever I could use spinach or cabbage.I never used to buy it at all. I am also about to try Stephanie Alexander's Silverbeet,pinenut and olive tart. I have also cooked with sorrel and tuscan kale which were new for me. I have just bought some kolhrabi seeds and I will be pretty impressed if I get a crop from them! Embarrassingly I don't think I have ever eaten a radish but I just planted some. Great, I'm glad other people are enjoying the fun of growing and eating weird and wonderful veges too! Love this post, Liz! I was going to do a similiar post on why I probaby won't grow corn & potatoes again. We call silver beet, swiss chard but your name describes it better as it is a beet. I like to chop up stems and leaves to cook with soy sauce, ginger and garlic. Good stuff. We have had to grow new things as like you, a lot of our favorites won't grow or are eaten by pests that I can't control. I just have to keep our own chickens and the wild animals out of the garden. I agree with you. We eat more of a variety now that we have a garden. I tend to think of being willing to eat what you grow as a survival skill. My tastes were pretty picky before but I've actually been able to appreciate cooks greens now that we can grow them. For awhile we were only growing tomatoes and peppers and only eating what you grow in that case isn't good either. even though we are a little apart, looks like we have a little garden interest in common. I stopped of the hop and really have enjoyed. I am having a give away of seeds, if you are interested. Blessing! I too grow what I can save seeds from .... so if you want anymore seeds just ask. We have changed the way we eat, since having the room to have a huge garden mostly stir fry and soups in winter. The biggest thing is you know its fresh and organic. I'm funny about buy veges now. I don't like buying the ones I know I can grow, even if I don't have them in my garden now. I buy way less veges than I used to, thanks to the garden, and just try to use what I've got. Tonight we had roast carrots and beetroot from the garden, plus mashed potato from the garden. I was just thinking today, it would be cool to join a fruit only CSA, as I would hate to join a fruit and vege one and be sent veges I've already got in the garden. I wonder if fruit only CSAs exist. Another thing to investigate. There's always something.